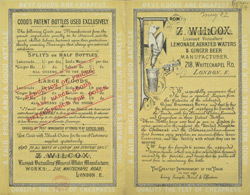 The leaflet contains a reference to a "Globe Stoppered Bottle". This innovation dates from 1872, when Hiram Codd took out a patent for a bottle that had a marble contained in the neck. When the bottle was filled under gas pressure the marble was forced against a rubber washer in the neck forming an airtight seal. This allowed the bottle to be used many times without the need for a cork. The globe-stoppered bottle was a great success and many manufacturers designed their own variations.